Occupying three long, rectangular rooms on the Lower Ground floor of DT Mega Mall, Super Tex Styles has the answer to all of your fabric problems. Many people (mostly my mom’s friends and my tailors) had told me about Super Tex Styles. I was told that you could find anything and everything there. But when I entered the store, my first thought was that I must be in the wrong place… until I saw a tiny door that led to another room, and then another. From basic lining material to embroidered net for a lehenga that will make people stop and stare, this store has the answer to all your needs. You’ll find everything under one roof, from sequin to cotton and shantoon to silk. Unless you already have a tailor who has given you instructions about how much to buy of what, you can actually get help from one of their masterjis. You can ask them for advice, how much fabric you’ll need for a particular design and even just give it to them for stitching – for an added cost, depending on the style, obviously. Not only tailoring services, they also have a wide variety of potlis to match your ethnic outfit and borders that could help you revamp an old one. The prices are more than what you would pay if you bought the same thing from Lajpat Nagar, just saying, but at least you’ll find parking way more conveniently and won't be pushed and prodded by a throng of people. 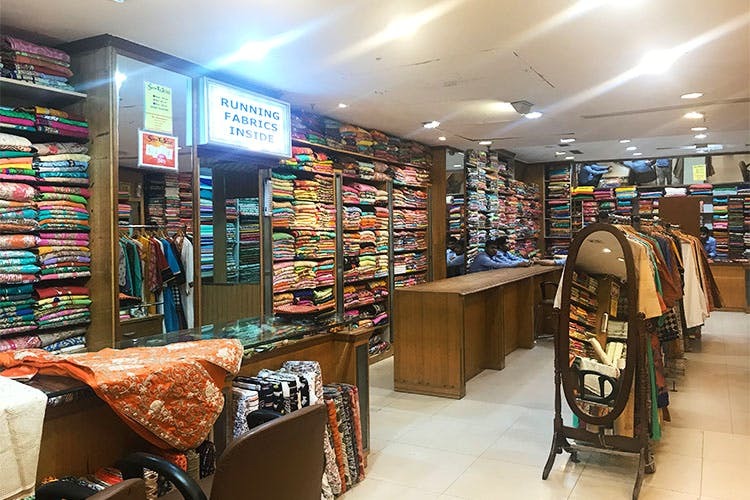 The store isn’t just good for fabrics but also for saris, semi-stitched suits and also readymade suit sets. While there aren’t any discounts on fabrics, they do occasionally have a 15-20% discount on some of these. In case you want to check before hand, just give them a call before visiting.